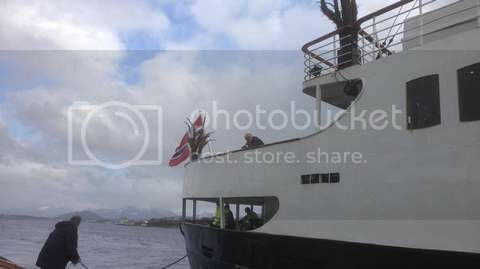 The "Star" came to Trondheim yesterday afternoon, and departed sometime around lunch again today: here are some images for you enjoy! Oh dear, what a beauty she is!!! She never looked better! Thank you Pakarang for these wonderful images. It is true, we can not get enough of her..... On June 4th she will be back in Trondheim again from 08:00 until 12:00! Beautiful ship indeed. She looks "busier" in style than Lofoten and I'm still pondering on the differences. So happy to hear that you enjoyed those images. From my own ship, it was a great opportunity to almost sail all the way around her. She was only sailing at 4-5 knots towards Trondheim, so it gave me a rare opportunity to see her from different angles. Wandering restlessly around Trondheim harbour, I suddenly saw famliar lines. And yes! There was Nordstjernen! Docked at the cruise pier! D**ned ISPS fence. I think she was doing some private cruising before her summer season at Svalbard begins in June. I wish her a happy summer and welcome back in the schedule next winter, taking Midnatsol's place! Last edited by Sigve; May 25th, 2015, 21:51. What is it that grows on her aft deck there??? I think she should have palms in the bow as well. Or on top of the wheelhouse. She must have picked those up in Trondheim I think. They were not there when Pakarang took pictures of her 4 days ago. Maybe somebody in the crew raided Palmehagen in Trondheim?? You can see her on that 92 passenger cruise at anchor in "This is Norway - all places without their own thread". (Posted a few days ago). Yes, with the same "palms" clearly visible, if that is what it is. Perhaps you remember the images I took in May this year as Nordstjernen came to Trondheim on her way northbound to the summer season at Spitsbergen/Svalbard? I was also very lucky to be in the right place when she came back on her southbound voyage after the summer season up north. Very fine, but these three are just so cooool! All eye-wateringly irresistible images of the dear star, and an amazing pakarang view also! Reminds me when standing on the pier at RIS in the 90'ies, waiting for her. She would appear just like in these pictures - at first far far away, then approaching while turning through the bends of Risøyrenna and finally dock. Thank you for such perfect quality images!!! It is nice to see that they apparently opened the bow section and the bridge wing for passengers. These are very nice spotter places! I agree... the bow is a very special place on these ships, though I do understand the safety aspect (mooring lines, bollards and obstructions). I too miss the opportunity to hang out at the bow, especially in rough waters. However, in this age of compensation frenzy, I can't blame the owners wanting to keep bow and stern clear, as they do on Lofoten.. These latest additions is a thrill for my heart, and surely, a thrill for any lover of this ship! Thank you so very much for sharing!